TGPAS member Ann Walter-Fromson gave a lunchbox talk Sept. 29 at on bird-friendly gardening at the NC Botanical Garden in Chapel Hill. The presentation was part of the garden's "Saving Our Birds" series of programs, workshops, and exhibits running from August to December 2016. An enthusiastic audience of 47 people learned about native plants that can provide food for birds in all seasons, and the importance of providing water, shelter, and places for birds to nest. 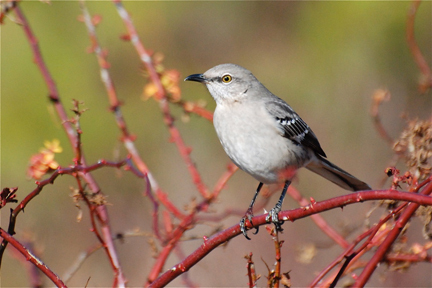 Ann highlighted NC's Bird-Friendly Native Plants for Birds program and introduced National Audubon Society's newly launched Plants for Birds initiative, including the interactive Plants for Birds database. On Saturday, Sept. 27, TGPAS board member Dennis Burnette presented “Butterfly Identification for Birders” at the Wild Birds Unlimited in High Point. We had 23 people for that one. He ended the presentation by talking about using native plants to attract insects and birds to our yards. On Tuesday, Sept. 20, Dennis also went to Asheboro where he did a program at the library on birds and bird watching. There were 28 people in the audience, including a family with three children. He talked specifically about the Bird Friendly Community project and referred people to the Audubon NC site for a list of native plants and a lit of garden centers where they might be able to find them. We sent an SOS, and you responded to the call to help clean the Audubon Natural Area for the annual Big Sweep held Saturday, Sept. 10. With no volunteers forthcoming from Greensboro Beautiful, which was unusual, we were in need of some worker bees. The Audubon Natural Area was "swept" clean of trash and litter on by a hardy bunch of Auduboners. Two full bags of trash were removed from the area, helping to keep it natural and aesthetically pleasing to visitors. We were even able to remove a few invasives in during the hour and a half outing on a beautiful sunny morning. Many thanks go out to Jack Jezorek, Lynn Allison, Linda Hayes, Stella Wear, Tom Wear, Tom Duckwall, and Ann Walter-Fromson. 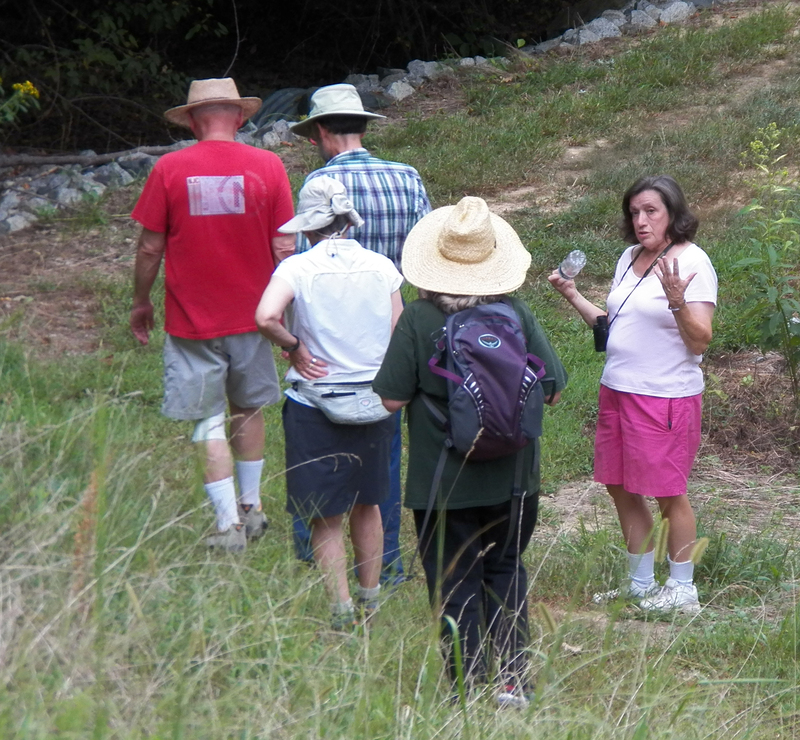 Ann Somers, a biology professor at the University of North Carolina at Greensboro, again asked Pearson Audubon to lead a nature walk and discussion for her environmental studies class. On Sept. 16 past board chair Dennis Burnette led a group of 12 students through the woods and around a meadow that has been restored with native plants in UNCG’s Peabody Park. The group was introduced to tree identification, native wildflowers, birds, and insects. The students got to see pollinators such as bumble bees and butterflies in the meadow working the native flowers for nectar. In the process, the bees transferred pollen from plant to plant. They also spotted an insect predator, a Great Spreadwing Damselfly. At the end of the walk, the group paused in the nearby shade to discuss the relationships among native plants, pollinators, and the birds that in turn use the insects for food. This is not only an important function for birds, these pollinators are responsible for 80 percent of our vegetables and fruits that can’t be pollinated by wind. Dennis talked about Audubon North Carolina’s Bird Friendly Community project that encourages homeowners to reintroduce some native plant species on their property to support this important process. Several of the UNCG students joined us to watch chimney swifts with us, and have expressed interest in attending upcoming meetings. Barbara Hughes, Bluebird Trail coordinator for Lake Daniel Park, reports that 2016 was a good year for baby bird raising. The 14 nest boxes along North Buffalo Creek in the park, 12 Bluebird and two Brown-headed Nuthatch boxes, hatched and fledged 37 Bluebirds, six Nuthatches and eight babies of other species. The first egg was laid on March 25, fairly early, and the last fledgling took off on Aug. 20. Many thanks to folks from the Westerwood neighborhood who did nearly all of the monitoring this year. TGPAS member Lynne Gray also participated. Thank you, Lynn. And many, many thanks to Barbara for her continued good work with this project. Barbara maintains and cleans the boxes and the area around them to keep vines away; and she recruits, trains, and coordinates the volunteers. We and the birds (a little birdie told us) appreciate her work. Barbara would very much like to have more chapter members help in 2017 to check the boxes a couple times during the summer. Make a mental note to volunteer next year. You will thoroughly enjoy the experience. TGPAS members celebrated the grand opening of Innovation Cornerstone of Greensboro's downtown Greenway on Sept 24. 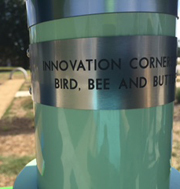 The "Bird, Butterfly and Bee Garden" was created with the joint efforts of our local chapter, the Carolina Butterfly Society, and the NC Native Plant Society, as part of the sculpture installation of the Woven Works Park located on the corner of Murrow Boulevard and Lindsay Street. Many thanks to efforts of supporters including Elizabeth Link, urban designer of the planning deptartment of the city of Greensboro. The site will evolve during the next year as the native plants welcome pollinators. Audubon North Carolina is opening the gates of its Pine Island Sanctuary near Corolla for a special nature journaling retreat for educators led by East Carolina University’s painting and drawing instructor Kelly Adams. Commemorate your sanctuary experience with illustrations that would make John James Audubon proud. For $255, spend the weekend exploring the 2,600-acre complex while enhancing your skill in drawing and journaling for nature. Fall is the perfect time to explore the birds, wildlife and diverse habitats of the Pine Island Sanctuary in Corolla. Click here to learn more and complete your registration. A new field guide may be of interest to members of the T. Gilbert Pearson Audubon Society and participants in our programs. Jonathan J. Storm, Ph.D., associate professor of Biology at the University of south Carolina Upstate, and his co-authors created the field guide to help the general public easily identify and learn about common organisms they may encounter in their back yard or while hiking a local trail or greenway. 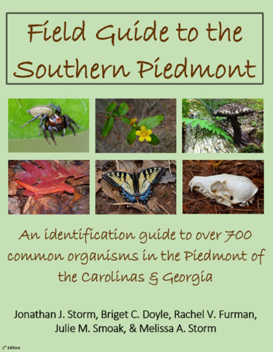 The Field Guide to the Southern Piedmont is a picture-based identification guide to more than 700 species in the Carolinas and Georgia and it includes common animals, plants, fungi, slime molds, animal tracks, skulls and bones, rocks, minerals, and nature sounds. It can be downloaded as an eBook for free to any electronic device from www.uscupstate.edu/fieldguide, and the picture for most species will hyperlink to a reputable website with natural history information. Although not a birding identification guide per se, this field guide could be useful for identifying other organisms you encounter while watching birds in the Piedmont. The Big Sit Is Coming! Our friends in the Piedmont Bird Club are planning to participate in The Big Sit, "a sedentary event." Just what IS The Big Sit? It’s like a tailgate party for everyone who like birds and enjoys watching them while sitting with other people, swapping stories, nibbling on snacks, and generally having fun. From 5 a.m. to 8 p.m. Saturday, Oct.8 (rain date Sunday, Oct. 9), the Piedmont Bird Club will be sitting at the Bog Garden, 1105 Hobbs Road, Greensboro. Bring your chair, binoculars, scope, bird books, snacks and drink, and best bird stories, and prepare to sit for as long as you would like. The Big Sit is a fun bird-watching event open to every person and every bird club. All that is required is a circle 17 feet in diameter and people to sit within it to count all the birds they see or hear during the period. The Big Sit is the creation of Bird Watcher’s Digest and has been around for years. More serious bird watchers should note that The Big Sit occurs just as the fall migration is in full swing, so add the opportunity to increase your life list on top of all the rest. 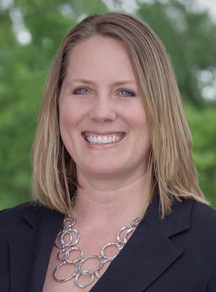 Find out about Audubon’s “New Directions” when Heather Hahn, Audubon North Carolina Executive Director, joins TGPAS at 7 p.m. Thursday, Oct. 13, at the KCE Family Library in Greensboro. With more than 15,000 Facebook fans, 10,000 members, 10 chapters and 10,000 online advocates, Heather oversees one of the most connected conservation organizations in North Carolina. Based in Chapel Hill, Audubon NC owns and manages the Donal O’Brien Jr. Sanctuary and Audubon Center on the Outer Banks, which includes 5,000 acres of diverse habitat near Corolla. Heather and the staff understand about saving Important Bird Areas – 96 are in North Carolina with 4.9 million acres. Coordinating Bird Friendly Communities as well as working with private landowners on forest management are just a few of programs highlighted in her presentation. You will also hear about the new National Audubon strategic plan, to which Heather contributed. Bring your questions and enjoy an evening with one of our favorite bird advocates! 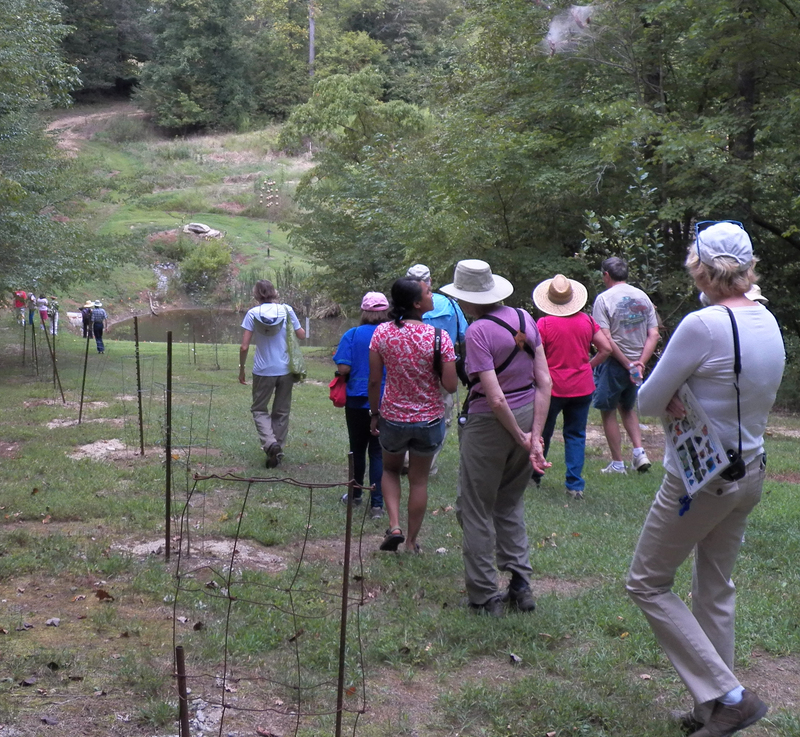 Enjoy our Second Sunday Nature Walk on Oct. 9 at one of Guilford County's special places. The Cascades Preserve Preserve is one of 14 that Guilford County has bought with bond funds, totaling about 1,700 acres. One of the most spectacular, the Cascades Preserve includes about 120 acres in the northwest corner of the county. This natural area features steep wooded bluffs, a great diversity of flora, and, of course, a cascading stream that drops perhaps 100 feet or more over wonderful rock outcroppings. A scenic loop trail samples all of these features of the preserve. Interestingly, the streams in the Cascades Preserve are not in the Cape Fear River basin, but rather in the Roanoke River drainage, flowing north into a tributary of the Dan River. Want to see this special place yourself, and check out the early fall fare? Then come along on this month's Second Sunday Nature Walk, SUNDAY, OCTOBER 9. Meet at 1:45 p.m. between the Chick-Fil-A and the BB&T Building under the Sears Plaza sign in the Whole Foods parking lot near Friendly Avenue at Friendly Center for car pooling to the site. As always, if it is raining hard we cancel. If it is just cloudy or misting, we go. We will be back around 5:00. Call or e-mail Jack Jezorek 272-6664 (suejackj@bellsouth.net) for more information. Please join us at 2 p.m. Saturday, Oct. 22. as we do a little fixing up at the Audubon Natural Area. The To-Do list includes nest-box maintenance, trail maintenance (clear debris, line trail with sticks, prune encroaching vegetation), and possibly see if any of the imbedded granite rocks on the back stretch of the Hillmer trail can be dislodged (I am personally looking forward to that challenge). Our new benches have plaques that need final affixing with tiny brass screws. Invasive plant removal is always an option, though we'll be devoting a day just for that in November. So, light-duty tasks, as well as projects to really sink your teeth into. Stay for 15 minutes or two hours. No matter what, your contribution will make a difference. As always, sturdy shoes and work gloves are recommended, along with tick repellent. Bring whatever tools you think might come in handy. It might be nice to bring a cold beverage. Being distracted from your work by birds or other critters is encouraged. The Audubon Natural Area is located along Tankersley Drive between Elm and Church streets, behind Moses Cone Hospital. Parking is available at the area by bumping over the curb onto the grassy entrance area, or at the bank at the corner of Tankersley Drive and Church Street. TGPAS again will present a series of three separate workshops for beginning birders presented by Dennis Burnette, a retired college professor, a nature educator, and an amateur wildlife photographer. Dennis is past president of T. Gilbert Pearson Audubon Society and a current member of the TGPAS board, past president of Piedmont Bird Club, and a past vice president of the Carolina Bird Club. These workshops are co-sponsored with Piedmont Bird Club. The topic of each of these workshops will be different. A participant may attend one, two or all three and receive different material each time. Each workshop will involve a 45-minute classroom presentation and discussion followed by 45 minutes of practicing skills outdoors. Members of TGPAS, Piedmont Bird Club, and the general public are invited to attend. Plan to bring your friends! Oct. 30, Sunday, 2:30-4:30, KCE Family Branch Library, “Introduction to Birds and Birding.” This workshop will focus on how to get started watching and identifying birds. We will follow the classroom portion by watching and identifying birds around the library and adjacent lake. March 26, Sunday, 2:30-4:30, KCE Family Branch Library, “Familiar Birds of our Lawns and Parks.” This workshop will focus on building bird identification skills followed by a bird walk in Price Park to practice seeing typical identification field marks on common birds. April 23, Sunday, 2:30-4:30, KCE Family Branch Library, “Attracting Birds to Your back Yard.” This will be a workshop about styles of bird feeders and types of bird food, including a variety of seeds, suet cakes and balls, and fruit. It will be followed by observation of nearby bird feeders. Stupendous, Wonderific, Awe-inspiring, Epic!! Well, OK, we witnessed a fantastic natural spectacle Sept. 15 at the Carolina Theater in Greensboro. 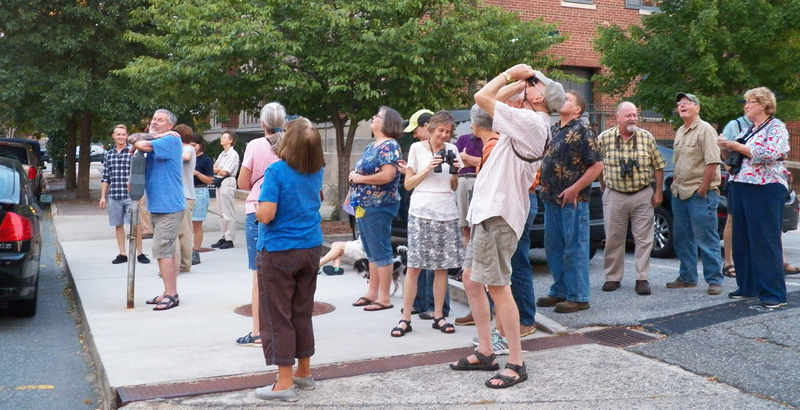 The Chimney Swifts came by the tens of thousands – we estimated about 10,000 to 30,000. This exciting event was attended by 30 participants who were totally amazed by what we saw. It could not have been better. About sundown the swifts begin to gather, swirling and twittering. A hawk sat on the chimney for several minutes, hoping for an opportune snack, but several swifts eventually chased it away. As darkness descended on us, the birds came from everywhere, got themselves organized into what looked like a swirling tornado and dove into the chimney at the back of the theater, chirping all the while. The flock was so large that birds were still trying to get in the chimney well after dark and we could no longer see them. We heard later that some folk had tried to see the swifts as they left the chimney watching from 8:30 to 11 a.m., but the swifts apparently slept in. 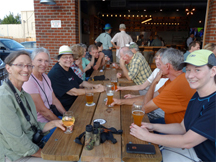 Our observers had first met for some social time at Joymongers Brewing Company (at left; photo by Lynn Allison) before driving to the theater. We have logged this chimney swift roosting site for Audubon North Carolina using the following link: https://www.surveymonkey.com/r/WTQ9H6V. We have also logged the other roosting sites we found while scouting for the Night Out. This is one of the ways that we citizens can help these threatened birds. Knowing where the swifts roost and nest is the first step toward preserving these sites. Other ways we can help these birds are explained at swift@audubon.org and nc.audubon.org. Keeping your chimney open provides nesting and roosting sites. Hire a chimney sweep to cap your chimney in November and uncap it in the spring. Another way to help swifts is to build a dedicated roosting/nesting tower. Paul and Georgean Kyle at chimneyswifts.org offer a book of instructions for a tower and other information on swifts. These are fascinating little birds which we have enjoyed learning about and watching. TGPAS will be assisting chimney swifts by building a tower (or towers) and conducting citizen science. You are invited to join in the fun. Editor’s Note: Many thanks to Stella and Tom Wear for organizing the event and scouting the area before the big night. It couldn't have been any better! There are tall tales, and then there are tall tales based on facts. At the Sept. 11 Second Sunday Nature Walk in Jamestown, everyone had to sign up to go on the walk. We meant people, but this request was taken very seriously by one Hackberry Emperor butterfly which landed on the T. Gilbert Pearson Audubon Society membership application. We will be waiting on that application to find out what areas of interest are marked, most likely asking for more flowering plants. Along with many butterflies showing up, 35 people went on the walk led by three different group leaders based on interest. This was a joint field trip with Piedmont Bird Club with special invitation to the NC Native Plant Society and Carolina Butterfly Society, and so participants had plenty of knowledge to share with others. 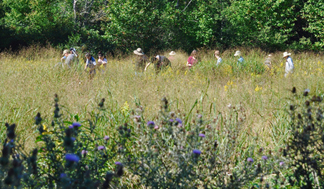 Even with the warm temperatures, the groups were able to see butterflies and birds using the newly established native plant habitats on the old farm. The property has been certified this year by the NC Forest Service as the only Stewardship Forest in Guilford County and certified as a Monarch Waystation in a continuing effort to create diverse habitat for all wildlife. Walkers had a wonderful day exploring tall grass prairies, newly established short grass prairies, pollinator plantings, a walk along the river, and various woodlands. On Saturday, Sept. 24, twenty folks gathered at the Blue Ridge Music Center on the Parkway for a nature field trip. 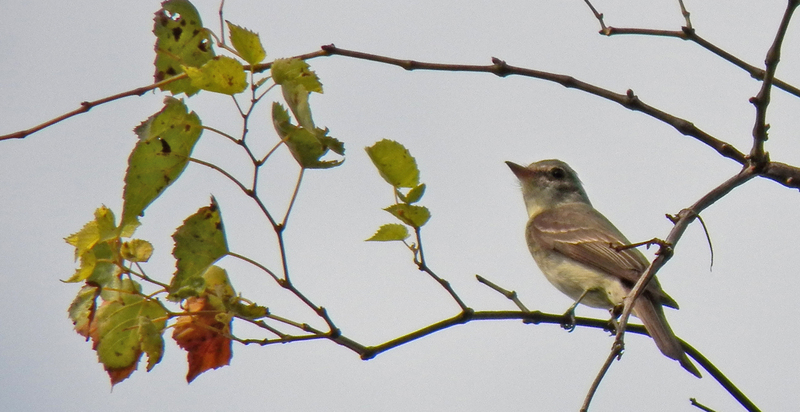 This was a joint trip with Carolina Butterfly Society, NC Native Plant Society, and Piedmont Bird Club. In addition, members of Forsyth Audubon joined us, so we had many knowledgeable people to help identify critters and wildflowers. This has been an annual field trip for naturalists, held near the peak of migration for hawks. Although no kettles of hawks arrived, we saw several Broad-winged Hawks and a number of warblers and other migrants. This date also is prime time for Monarch Butterfly migration. These butterflies tend to follow the Parkway on their journey south to Mexico. We didn’t see a huge number this time, but we did see two adults and four caterpillars. We saw about 16 species of butterflies in all. Several people got to watch as Meadow Fritillaries, a higher elevation specie that we don’t have in the Piedmont, were laying eggs near their caterpillar host plant, violets. After exploring the music center, we had a picnic in a nearby meadow and then proceeded south of the Blue Ridge Parkway for a few miles. The early autumn wildflowers were blooming in profusion. As hoped, there was something to see for just about everyone on this beautiful, sunny, cool fall day.